• Benjamin Airgun model Varmint Power Pack. • Centerpoint Scope 4x32 mm. • Targeting Laser with push on/off button or remote tape switch. • LED Flashlight with red flip-up filter. Gas piston airguns are easy to shoot, maintain and own. It contains a piston and uses a cylinder filled with a compressed gas as it's power source. Advantage of a gas piston system as a power source is that it causes less noise and vibration, making it easier to shoot accurately. 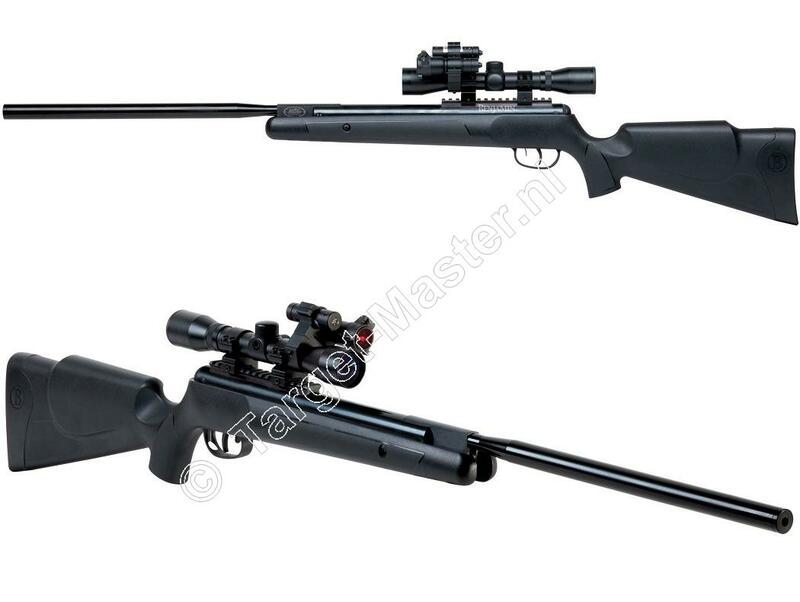 This break barrel airgun is cocked by securly holding the stock in one hand and, while firmly holding the barrel with the other, pulling the barrel down. It breaks at the breech. As the barrel is pulled in a downward motion the piston is pushed back compressing the gas in the cylinder. Keep pulling until the piston is locked in place. 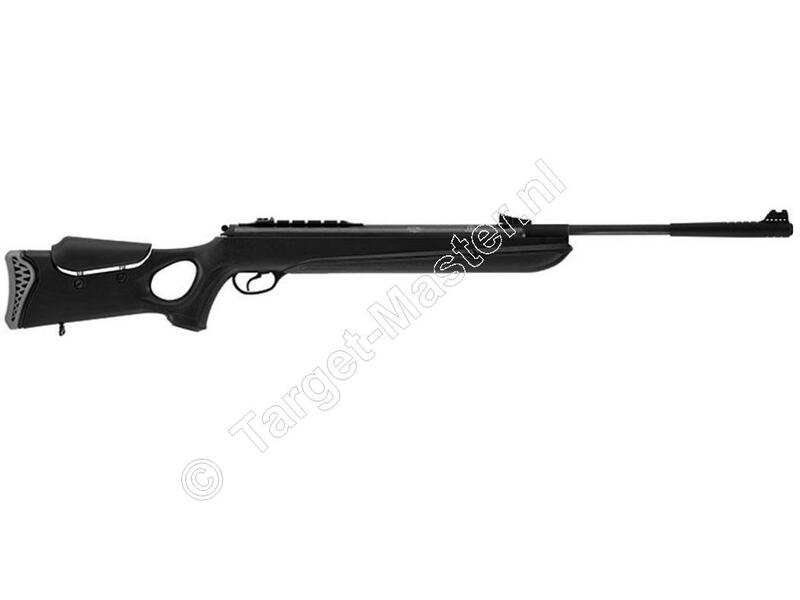 With a break barrel airgun the pellet is placed directly into the breech. After loading the barrel is swung back into position. Now you are ready to fire. After the airgun is aimed at your target, take the safety off and put positive pressure on the trigger. When you pull the trigger, the piston is released and the compressed gas causes it to jump forward. This action compresses the air in the space ahead of the piston. The air is driven through a nozzle, into the rear end of the pellet sitting in the breech. The effect of all this causes the pellet to move out the barrel at high speed towards the target of your choice. Many factors affect airgun performance and velocity. Results may vary as much as 20% due to brand, weight and shape of projectile, lubrication, barrel condition, indoor shooting, outdoor shooting, temperature, shooters skills and other factors. There may be a break-in period. During this period accuracy may be inconsistent and your gun may seem loud. This will improve as the system breaks in. Purchase of this article requires a minimum age of 18 years. To be able to purchase an Air Rifle as stated by law you need to have reached the minimum legal age of 18 years and need to be in possession of a valid Identification being a Passport or Identity Card. This valid Identification has to be in your name and needs to show you have reached the minimum legal age of 18 years. You need to prove your age and possession of a valid Identification by sending us a clear readable copy of your entire Identification. This clear readable copy of your own valid Identification can be send to us via Post or E-mail. When the Air Rifle is being delivered the data of your Identification will be checked and the data hereof Registered.